Last weekend was destined for an epic adventure - long weekend, my birthday, and both of us off work. For us, three days off is a rare treat that must be fully utilized, so we busted out a map and decided to research everything in an eight hour radius to find the perfect place for a grand adventure. Yellowstone National Park happened to fall within that radius, and having never been, I immediately decided it was the place. Best decision ever. 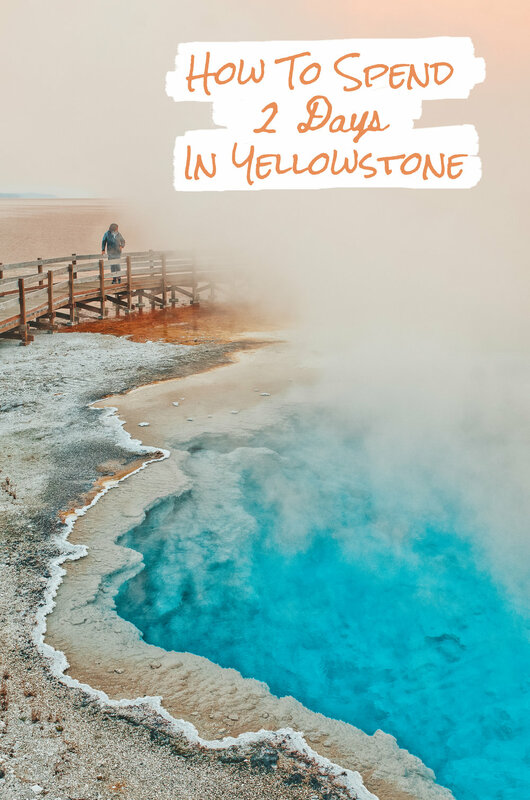 We only had two days in the park, but we felt like we saw a lot, so I'm going to share our itinerary in case you want to do your own mad dash to Yellowstone. Fountain Paint Pot - If you enter at the west entrance to the park, near Madison, like we did, then the Lower Geyser Basin is the first big geothermal area you'll encounter as you make your way around the park in a counterclockwise direction. 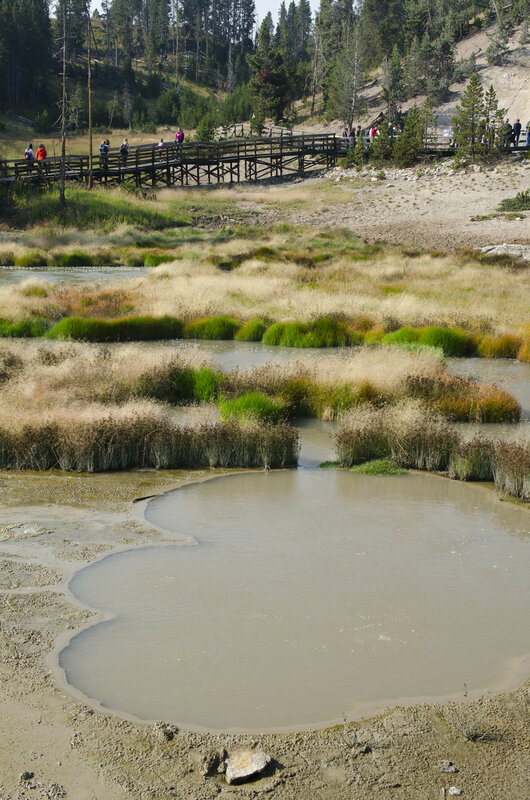 Fountain Paint Pot is the biggest attraction in basin, with boardwalks wending around pools, mud pots, and geysers. We ended up bypassing Fountain Paint Pot on our way in and visited it late that evening, thus the lack of photos. 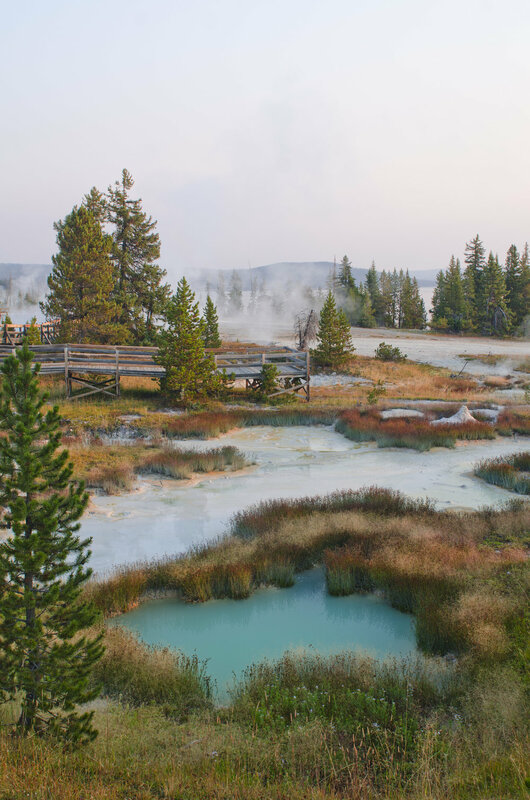 Midway Geyser Basin - If you decide to see the sights in order, this is the next stop. 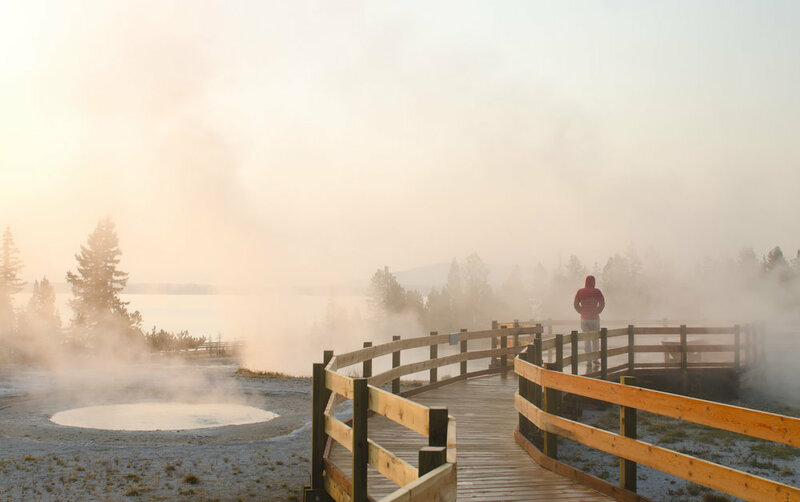 Midway Geyser Basin boasts the illustrious Grand Prismatic Spring, the parks largest hot spring and arguably one of the most photographed sights in the park. 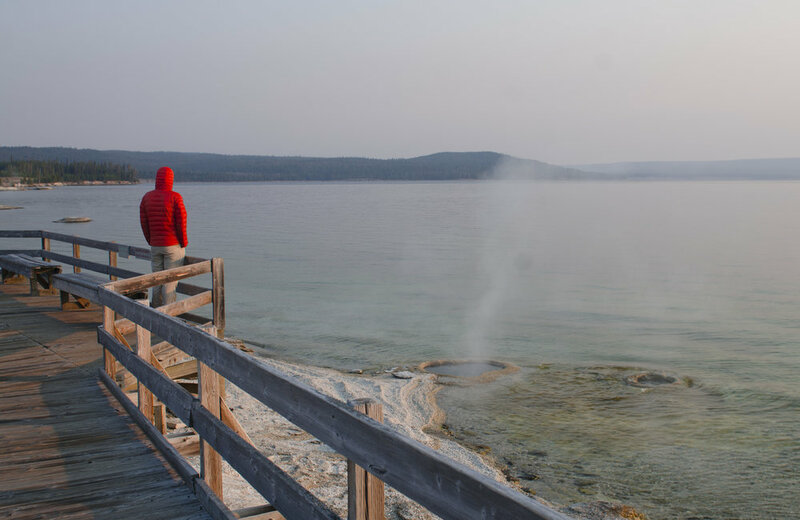 You'll also get to see Excelsior Geyser's crater and spring, which sends 4,000 gallons a minute of steaming water cascading into the nearby Firehole River. 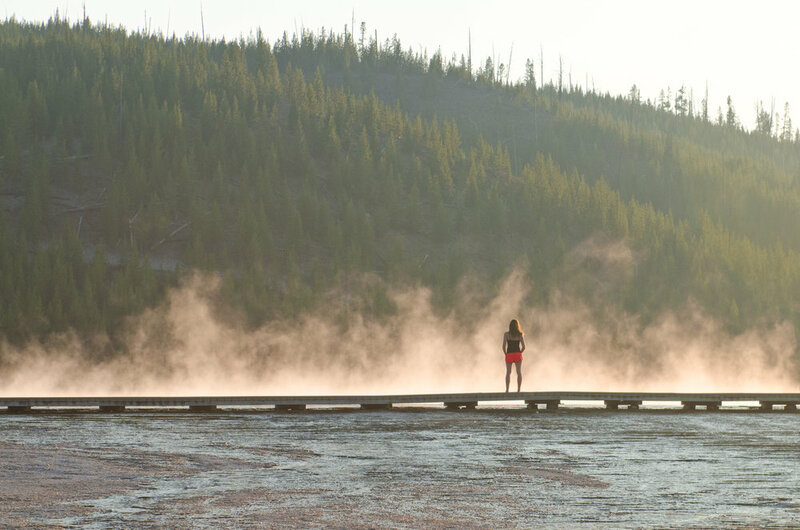 FYI: to get the best view of Grand Prismatic Spring, you'll need to drive a little past the main parking area to the Fairy Falls trailhead, where you can take the trail to a viewpoint overlooking the spring. 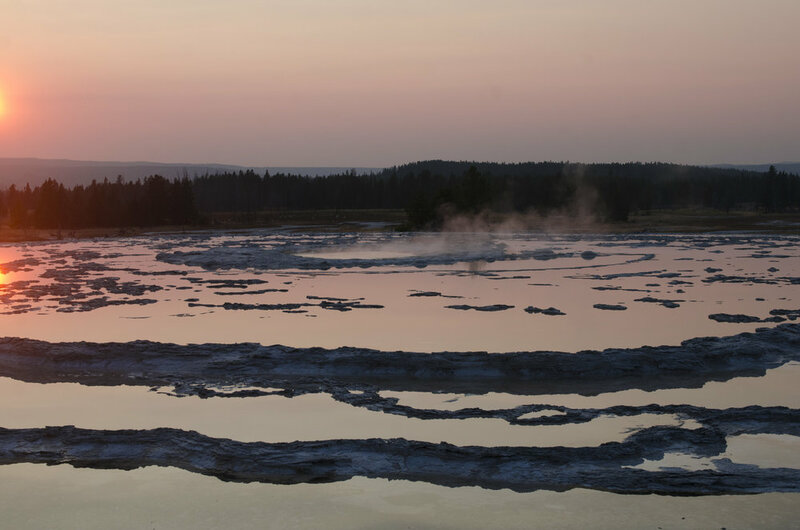 Upper Geyser Basin - Around 150 geysers are crammed into a square mile in Upper Geyser Basin, the most iconic of course being Old Faithful. Worth a visit despite the summer crowds. Old Faithful erupts at 60-110 minute intervals, which prediction times posted in most buildings in the area so that you don't have to sit around wondering when the next eruption will be. When it erupts it can shoot up to 184 ft (average is 130 ft) and the eruption lasts for 1.5-5 minutes. We watched it erupt once in the day and then returned that night to capture some long shutter speed shots. Biscuit Basin - This was actually the first place we stopped in the park (we did a lot of backtracking since we weren't given a map at the entrance and had no idea where we were going!) and I was totally in awe. My response was a steady stream of "Justin look at this! Come here and look at THIS!!" Justin, who's already been to Yellowstone several times, didn't quite get my extreme excitement but kindly followed me around as I took a gazillion photos. Firehole Lake Drive - The evening of the first day found us backtracking to Firehole Lake Drive, a three mile one way loop off the main road with easily viewed hot springs and geysers. It's a beautiful area to watch the sun set and we made the most of it from the back of the van with the doors thrown open. 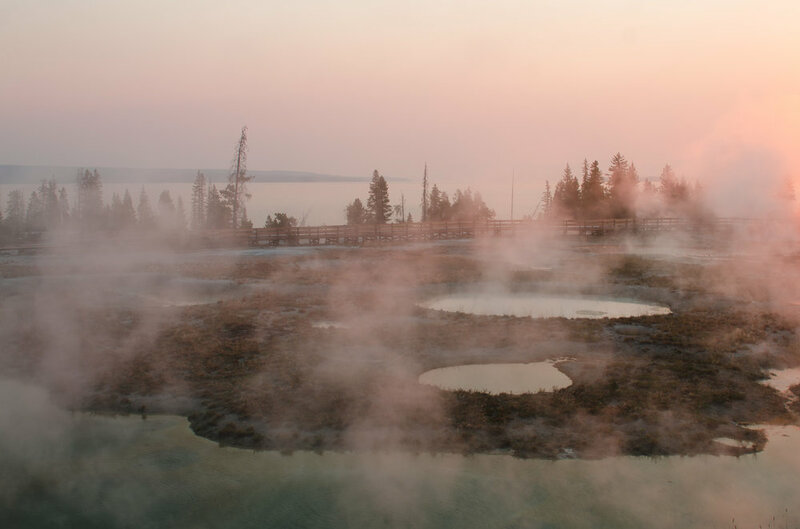 West Thumb Geyser Basin - We read that this was a great area to be at sunrise, as you can watch the sun come up over Yellowstone Lake from boardwalks meandering amongst pools and geysers along the lakeshore. So glad we made the effort to get up early and drive to West Thumb, because we ended up getting to see a spectacular red sunrise that was pretty out of this world shining through all the steam. West Thumb ended up being one of my favorite places in the park! Hayden Valley - One of the best places in the park to see bison, grizzlies, moose, osprey, coyotes, and wolves. True to form, this was the first place in the park where we saw bison. Even better, they were gathered around a geysers across the river, which was crazy picturesque. Mud Volcano Area - This area is actually in Hayden Valley from what I can tell and was just across the road from the area where we saw all the bison by the geyser. This area features boardwalks meandering amongst fumaroles, springs, and bubbling cauldrons of mud. My favorite feature there was Dragon's Mouth Spring - a small cave from which boiling water flows out into a pool in surging waves. Steam and bizarre sounds also emit from the opening, making the whole dragon's mouth thing quite believable. 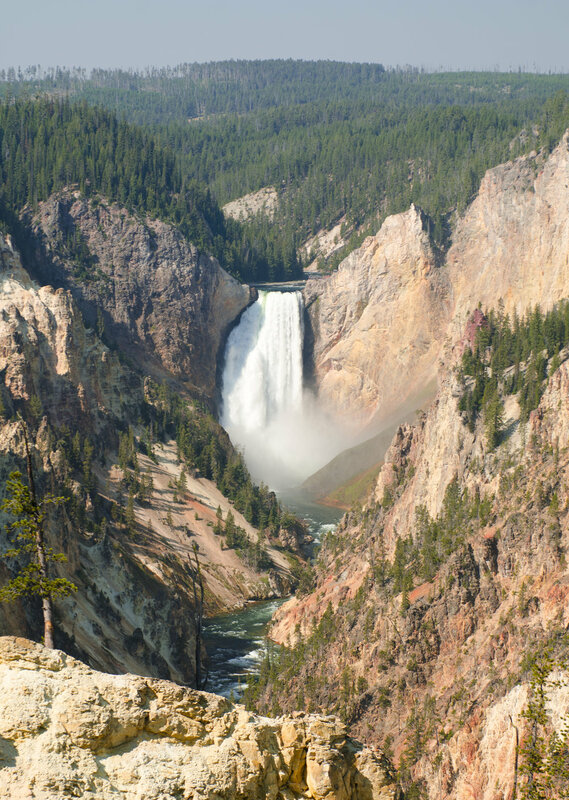 Grand Canyon of the Yellowstone & Lower Falls - An amazing 1,200 foot canyon that houses an upper and lower falls. Of the two, the lower falls are the more famous, plunging 308 feet into the narrow canyon below. Mammoth Hot Springs - Mammoth Hot Springs has been a popular feature in Yellowstone since the days when stagecoaches used to travel up the Yellowstone River Valley. The main feature is colorful terraces of mineral deposits, such as calcium and travertine, with seeping (and in some places cascading) hot springs. While we found the features interested, the area was packed and we had an incredibly hard time finding parking. Maybe that tainted our experience, because if I were to choose one thing to drop out of everything we saw, I'd say Mammoth Hot Springs. It took quite some time to drive to drive to on the route we took and just didn't seem totally worth it. If you don't have a lot of time we'd suggest cutting across just above the Upper Falls on the road towards Norris. Firehole Canyon Drive - As you complete the loop and drive past the western entrance of the park (just past the Madison Campground) you'll come to Firehole Canyon Drive - a one way loop along the Firehole River. We didn't know anything about it but were glad we'd turned off when we came upon a lovely swimming area where the river flows out of a narrow part of the canyon below Firehole Falls. The Firehole River Swimming Area is one of the few designated swimming areas in the park and perfectly refreshing. Not too cold, not too warm, and a great area for families. There's a nice current at the entrance of the canyon, but the river quickly widens and there's a sandy beach perfect for little ones. Yellowstone is such a huge park that I'm sure we missed a number of things, but overall we were pretty happy with what we saw in two days! We'll be back though :) Let us know if you have any must see suggestions or questions, and check out the map below to better visualize our route.